If you are eager to compete with other players while playing your favorite slot while getting a chance to get a huge reward check out the Contests! Participates everyone, who joins a contest. You enter the contest upon getting a winning spin. 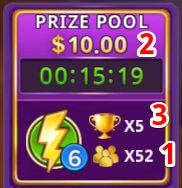 There are two icons with numbers which show how many winners and participants are now. The prize pool is formed in $ G-Coins packs from a certain part of all participants' winnings and is split among all the winners. The participants who have the most amount of PTS become winners. The number of winners depends on the number of participants. PTS doesn’t depend on the current level or tier during a contest. The major factor that influences PTS is a win-bet ratio, i.e. your luck! Before the 1.19 update the win was converted into G-Coins according to your Shop page and tier without any special offers, special promotions, and sales. And now the win is converted into G-Coins according to your Tier's Prize Multiplier.